Key West Drive runs across the lower part of the photo; downtown Dubuque is about four miles to the right. Originally US 61 traffic was routed along Key West. 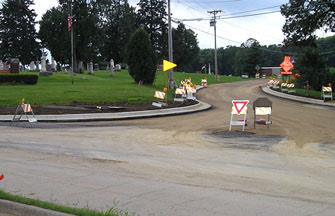 At that intersection, southbound US 161 began ahead by splitting off onto Old Military Road (more info on this Iowa Highway Ends page). ​In 1938, US 161 was replaced by extensions of US 151 and US 218.